The churches are in Youhanabad, a Christian locality in Lahore housing at least a million people, the largest such concentration of Christians in Pakistan-. Christians form barely two percent of Pakistan’s 180 million population. Many, belonging to the lowest socio-economic strata, are marginalised, poorly educated and vulnerable. Since the ghastly attack on Peshawar’s Army Public School on December 16, 2014, people have been holding vigils on or around the 16th of every month to commemorate the Peshawar school children and teachers. The aim is to keep alive the memory of the dead in that attack, to never forget, and “never let you forget”, as Rehan Mazhar, a student activist in Karachi puts it. Activists, both seasoned ones and those new to public protests, doggedly held their global vigils against terrorism in January, February and March in all kinds of weather. 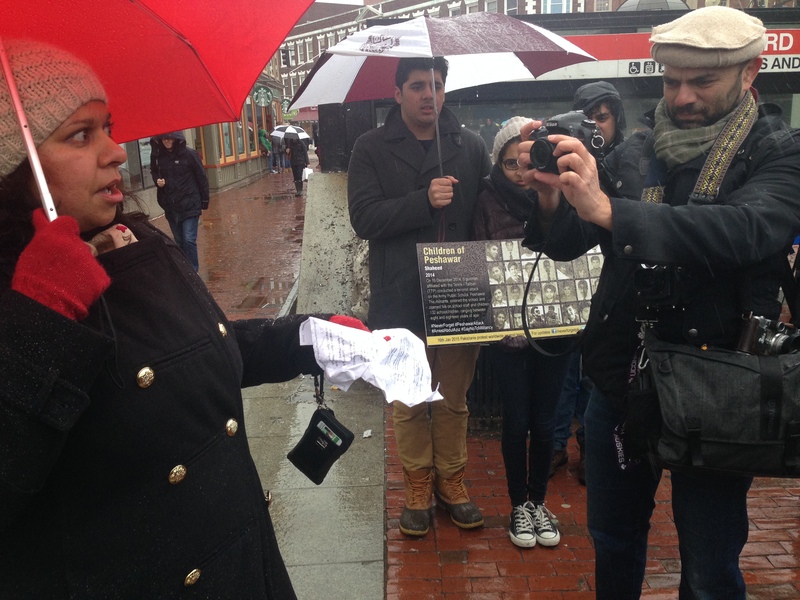 At the Boston vigil on March 15, Chanta Bhan, the Protestant Chaplain at Tufts University Interfaith Chaplaincy expressed her pain at the attack on her community in her hometown Lahore, and gratitude at the solidarity of other Pakistanis. The mainstream media give headline space to violent, sensationalist atrocities. Ordinary citizens’ peaceful protests are not deemed newsworthy enough for sustained or prominent coverage, even if they come out despite a risk to their lives in a country like Pakistan. More tragically, intervals between the solidarity and protest vigils are punctuated by continuing attacks on soft targets by the Pakistani Taliban and affiliated organisations. These attacks are becoming sickeningly predictable. It is now routine for extremists to attack mosques on a Friday, the holy day for Muslims when afternoon prayers draw the most worshippers at mosques. Barely a month after the Peshawar school attack, suicide bombers targeted a Shia Imambargah in Shikarpur, Sindh, on Friday, January 30, killing over 60 people, many of them children. A similar attack at an Imamabargah in Peshawar left over 20 dead on Friday, February 19. The Taliban and their affiliated groups adhere to a Takfiri ideology – Takfir is to declare another Muslim as an apostate or non-Muslim – and say that Shias are not Muslims. The first step towards official Takfir in Pakistan was the second amendment to the constitution in 1972 that declared the Ahmadis as non-Muslim. It is the prevalence of this divisive narrative, drummed into society over the years through the media, discriminatory laws and school textbooks that leads to confusion in many Pakistani minds and creates a base that in some way justifies or plays down such attacks. On Friday, May 28, 2010, gunmen attacked two Ahmadi mosques in Lahore, killing nearly a hundred people. Some of the worshippers caught two attackers and handed them over to the police. The perpetrators are still in prison but have yet to be sentenced. Last Sunday’s church attacks, which till last count had claimed 15 lives with at least 70 injured, took place during services when the churches were full of worshippers. 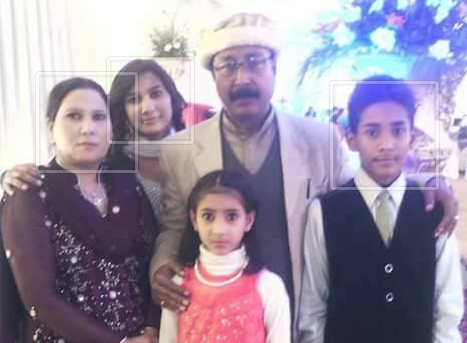 Volunteer security guard Zahid Yousaf Goga with his family. The dead included volunteer security guards, one of whom ‒ Zahid Yousaf Goga, a Muslim ‒ grabbed hold of a suicide bomber and was killed while trying to save the worshippers. The Christian community has appreciated his heroism. 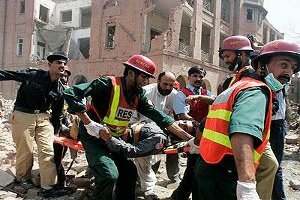 On September 22, 2013, suicide bombers attacked the colonial-era All Saints Church in Peshawar at Sunday Mass, killing more than 80 people and injuring scores more. Such attacks are continuing horrible reminders of what happens when you keep snakes in your backyard, to use Hillary Clinton’s term. For this to change, Pakistan’s political and security establishments need to discard the unstated policy that enables Takfir, namely declaring someone a non-Muslim. They must impose the rule of law and end the culture of impunity that allows criminal actions in the name of religion to go unpunished. No more ‘good Taliban, bad Taliban’. It is a sign of the brutality and rage that engulfs Pakistan that an enraged mob in Lahore protesting against the Sunday’s church bombings lynched and burnt to death two men that the police had apprehended on suspicion of involvement in the attacks. The charged mobs dragged the men out of the police vehicle and beat them to death before setting their bodies on fire. Many men in the crowd used their cell phones to film and photograph the gruesome murders. 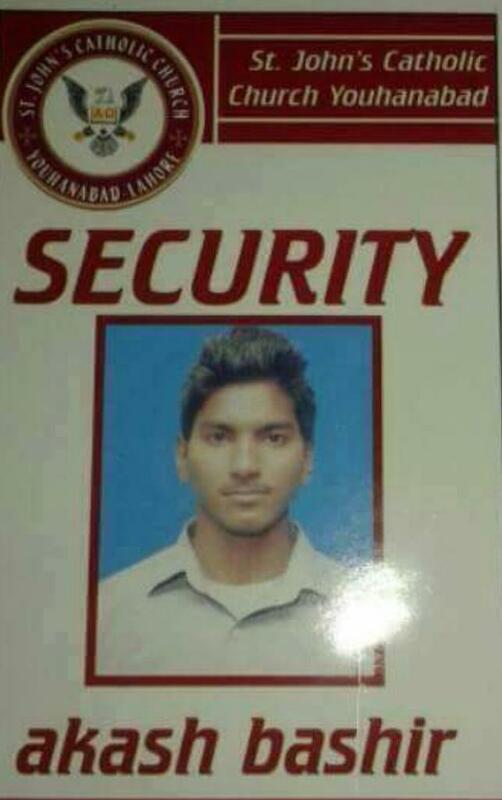 One of the men has since been identified as Mohammad Naeem, a grass-cutter. Sensationalist reporting by some media is adding fuel to the fire in what is already a volatile situation. “Enraged Christians burn to death two Muslims!” blared the March 16, 2015, front-page banner headline of daily Ummat, the Urdu language mouthpiece of the right-wing Jamat-e-Islami. 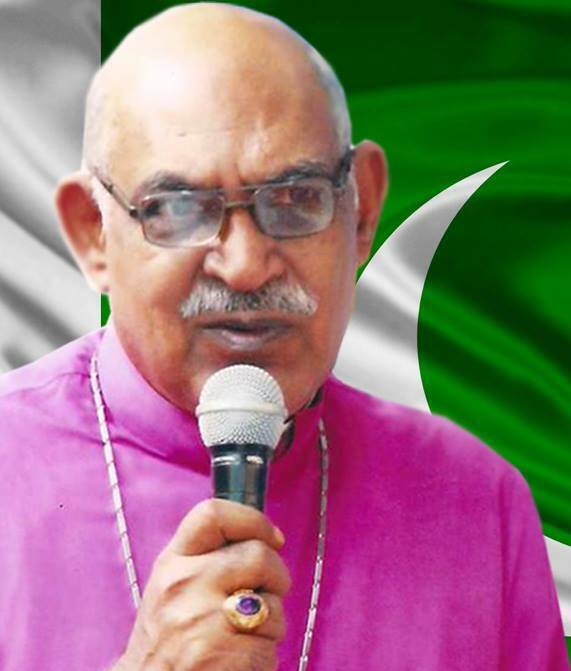 Karachi Bishop Dr Ijaz Inayat: A Muslim Christian clash is being developed “in a very organized way”. Bishop Ijaz Inayat in Karachi told me he feared that a Muslim-Christian clash was being developed around Youhanabad “in a very organised way”, perhaps to divert attention from the real issues facing Pakistan. He condemned the suicide attacks on the churches as “not Islam, but the creation of an extremist self-styled version of Islam that kills innocent humans”, and the reaction of the protesting Christians in various cities as “a show of extremism”. But the most virulent extremism remains the organised, targeted killing of Pakistani citizens belonging to non-mainstream religions and sects by the Taliban and their affiliated groups with the avowed purpose of creating an Islamic state. Clearly, given the resistance they face on so many fronts, it will not be a walkover. Resistance lies not just the global vigils and increasing calls to impose the rule of law, but also in the powerful music, poetry, literature, art, film and theatre of the country, showcased regularly at festivals and seminars, fashion shows and fundraising galas for good causes like education. There is resistance in the continuation of the ongoing democratic political process and in the recent judgment by the Islamabad High Court upholding the death penalty for Mumtaz Qadri, the security guard who gunned down Punjab governor Salmaan Taseer for having allegedly blasphemed. A false start is not something that Pakistan, or the world, can afford. The dead included volunteer security guards, one of whom ‒ Zahid Yousaf Goga, a Muslim ‒ grabbed hold of a suicide bomber and was killed while trying to save the worshippers. The Christian community has appreciated his heroism. – pls get your right Been a, he was Christian.